ALCORCON/27 October 2016 The Ministry of Defense has declassified 80 reports concerning "Sightings of Strange Phenomena (UFO Files)" running from 1962 to 1995, including the one recorded on March 19, 1978 in Alcorcón. This file, catalogued under Number 780319 and to which Noticias Para Municipios has gained access, includes up to six photos of strange lights photographed by a citizen from Parque Lisboa. The snapshots were submitted to the Office of Information and Dissemination of the Military Secretariat of the Ministry of the Air. Images of unidentified flying object were taken from a ninth story [building] in the direction of the Andalucía Highway, according to the file. Since the photographer could not be questioned, the Air Command "requested an analysis" of the photos for inclusion in the file. 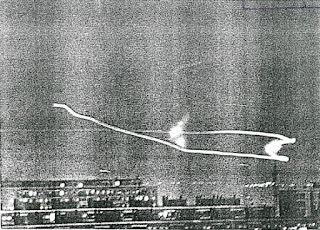 The luminous wake of an object that appears to be flying at high speed can be seen in the declassified report, engaging in very tight turns in several directions. Techniques such as GSW were employed "to improve the clarity of the photos considerably" and "reveal concealed details." Throughout the process, specialists engaged in the analysis did not dismiss the possibility that the photos were hoaxed. This "rather plausible working hypothesis" was based on the possibility that photos of the area had been obtained initially and subsequently manipulated in the developing process. In any event, the analysis showed that in the case of the photo marked with the number 1, the image was simply the "outline left by a jet airplane" and that it lacked volume, in other words, no physical and material object was present. "Photos 2,3,4 and 5 - says the report - does not show the existence of any object with volume during the start or end of the outlines." 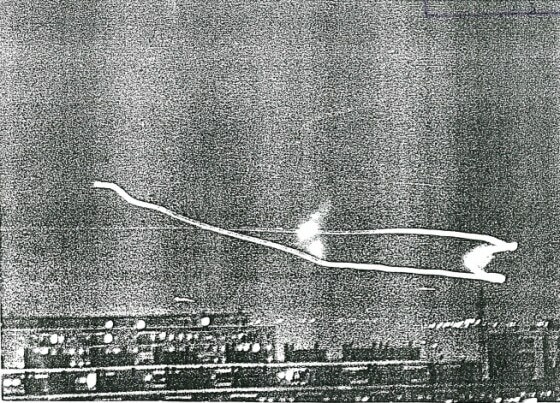 The sixth image submitted to the Ministry was enlarged and digitized, showing the existence of a physical flying object. But immediately following, the analysis shows that it was "an airplane engaged in an approach maneuver (or takeoff) toward a landing area. The authorities concluded with absolute certainty that file 780319 - in spite of the lack of the original negatives - these would not contribute any "additional information worth mentioning, unless it was to fully expose the nature of the hoax," it says.